The Hôpital Charles-Le Moyne (Charles-Le Moyne Hospital), a part of the CSSS Champlain—Charles-Le Moyne, is the major hospital in Longueuil, Quebec, Canada, with an in-patient capacity or nearly 500 beds. This teaching hospital is affiliated with the Université de Sherbrooke and has a link to the Université de Montréal, with training programs for students in medicine, nursing and other multidisciplinary programs.At present, about 5,000 people are employed at the CSSS, and the hospital receives about 400, 000 visitors a year and a further 70,000 visits at the hospital’s emergency room (ER). 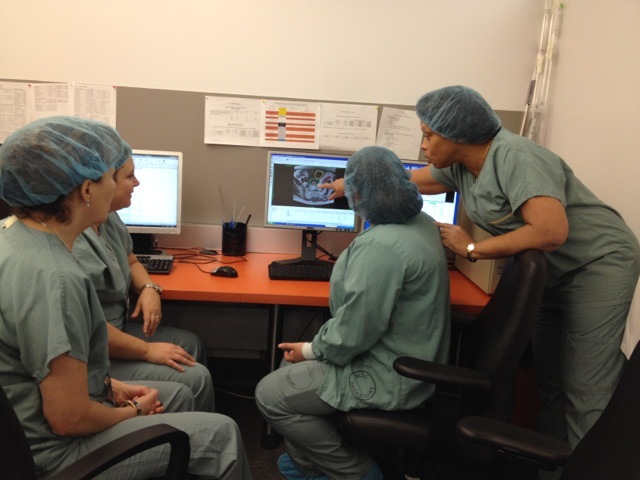 The Radiation Oncology department introduced Iridium based HDR brachytherapy in 2012. A dedicated brachy team consisting of 5 radiation oncologists and 5 physicists treat around 9 patients with brachytherapy a week. The staff has significant clinical practice in a broad range of body sites and techniques, for example in breast, prostate, gynecological, head & neck, skin and lung. The hospital is equipped for HDR image-based treatment using all imaging modalities including CT and MRI. Dr Marjory Jolicoeur, radiation oncologist at Hôpital Charles-Le Moyne, organizes regular brachytherapy workshops organized under the umbrella of Curietherapies, an initiative designed to promote standards of practice in brachytherapy, to stimulate exchange of scientific knowledge, to discuss the literature and to compare individual expertise. Hôpital Charles-Le Moyne is a designated BrachyAcademy Educational Center. Training visits to the hospital are organized for people wishing to learn more about HDR brachytherapy for breast, head & neck, prostate and gynecological cancer, where they can observe clinical workflows and daily practices at first hand. Clinicians, physicists, technologist and nurses from all over the world can observe clinical workflows and daily practices during 1 to 4 days clinical attachment.